Gum recession not only ages your smile, it creates causes painful sensitivity to temperatures and sweets. 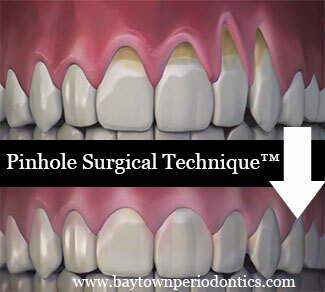 Based in Houston & Baytown, TX, Dr. Khalid uses minimally invasive microsurgical techniques to perform cutting edge gum recession treatment and gum grafts. Dr. Khalid is among the first group of dentists and periodontists in Baytown, TX to be trained in the new technique, invented and patented by Los Angeles dentist Dr. John Chao. The Chao Pinhole Surgical Technique�, also known as Chao Pinhole Gum Rejuvenation� has been covered in numerous television news stories and newspaper articles across the country and will soon be featured on national television. Receding gums can make anyone look older, often cause tooth sensitivity and may lead to tooth loss. Gum recession can be caused by excessive tooth brushing,�gum disease�or the normal aging process. "Many people are unaware of the condition until their teeth become sensitive to cold temperatures because of root exposure. Others may be concerned by the unsightly appearance of their receding gums." says Dr. Khalid. A 33-month study of 43 patients with 121 gum recessions using the Pinhole Surgical Technique� was published in the October 2012, issue of The International Journal of Periodontics and Restorative Dentistry. The results of this study were as successful as traditional gum grafting procedures which require cutting and sutures, while patients who underwent the Pinhole Surgical Technique� reported virtually no pain, no bleeding and high satisfaction with a rapid transformation of the defective gum line.